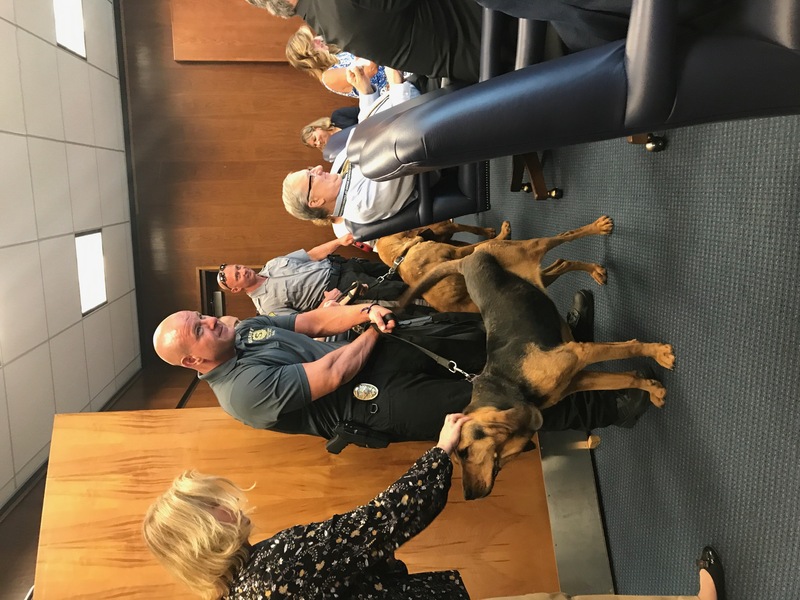 The Ocean County freeholder board gives out many resolutions to residents who have served their county each year, but this week, two four-legged residents (in care of their humans) were the recipients. The county wished two hounds from the Sheriff’s Department well in their retirement. Emmit and Gertrude, 9, made the rounds, receiving plenty of head scratches and hugs in the third floor meeting room of the county administration building. 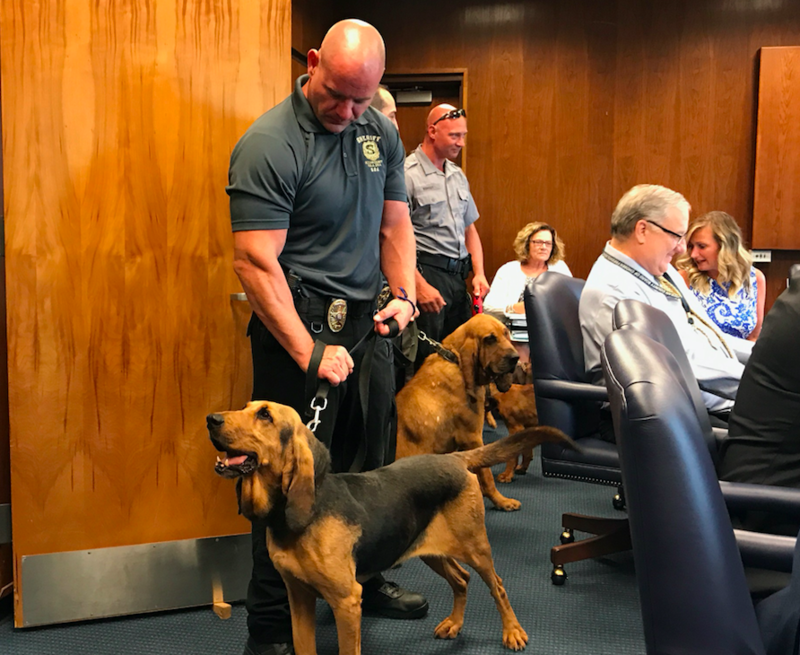 Ocean County was the first agency in the state to use bloodhounds for law enforcement purposes, said Sheriff Michael Mastronardy. Gertrude, in particular, is credited with cracking numerous difficult cases, including leading investigators to the suspect in an armed robbery in Brick last year. Gertrude tracked the suspect’s scent for three miles and successfully led officers to his location. The dogs also participated in a town-wide sweep of Seaside Park after the 2016 terrorist bombing incident. 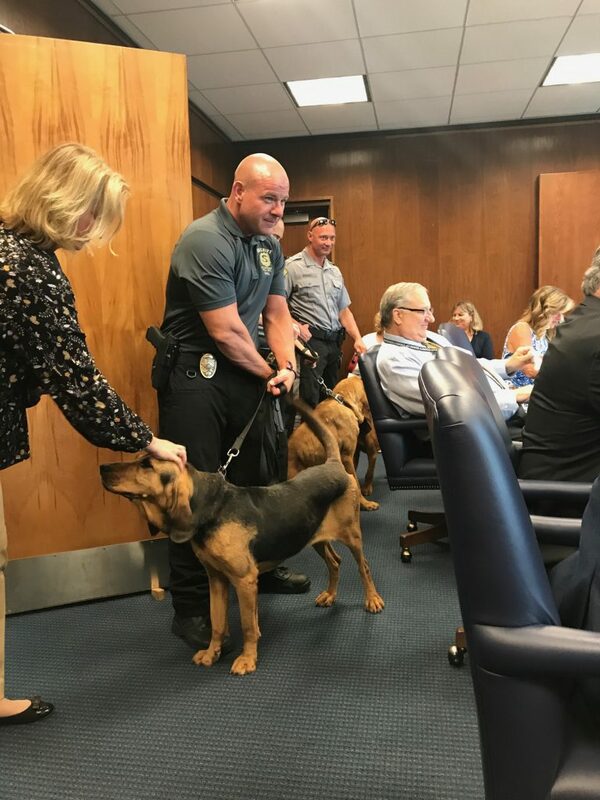 “The K9 has obviously been an integral part of our operations,” said Mastronardy, adding that a training exercise just last week provided all the proof needed to show who’s top dog in the K9 world. The training exercise called on the dogs to find a missing couple deep in the woods. “We expected it would take an hour or an hour-and-a-half, but they ended up finding them in 17 minutes,” said Mastronardy. 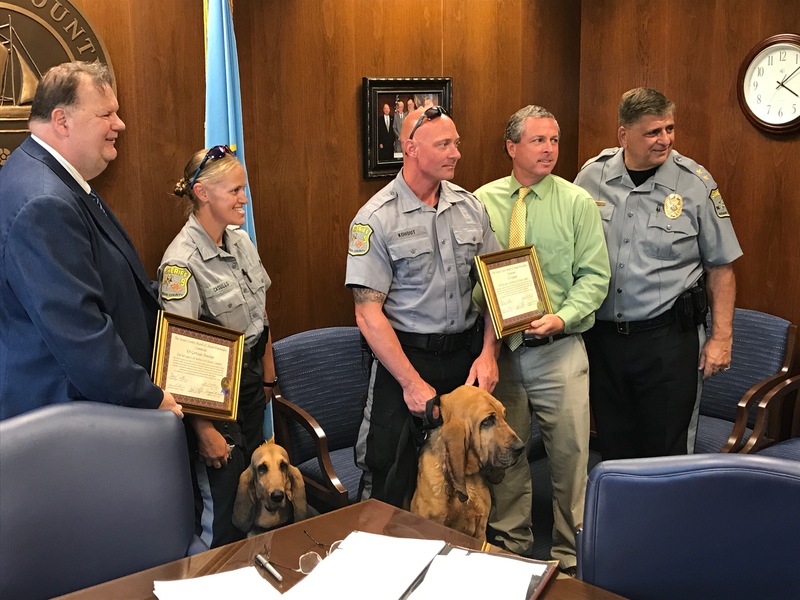 The two dogs, who will spend their retirement as family pets in the homes of their handlers, will be replaced by Fiona and Clifford, two bloodhounds that are just 11 weeks old. The Ocean County Sheriff’s Department has a nationally-certified trainer, Officer James Kohout, on staff who will train the two new dogs. Mastronardy said many residents may not realize just how often K9s are used by the department. They can track suspects, find missing persons and detect explosives. “We’re nonstop with the explosive dogs,” said Mastronardy, counting 20 sweeps in the first 10 days of July.